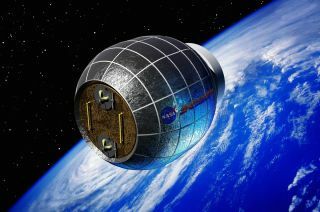 Artist's concept of the Bigelow Expandable Activity Module (BEAM), which is scheduled to arrive at the International Space Station in 2015. TORONTO — A privately built inflatable room for astronauts on the International Space Station is on track to launch into orbit next year. The Bigelow Expandable Activity Module (BEAM) is expected to head to space inside SpaceX's Dragon cargo spacecraft in 2015, according to a senior representative for the company Bigelow Aerospace, which is building the module. Once BEAM gets to the space station, the robotic Canadarm2 will install it on the Tranquility node's aft port to test out expandable-habitat technology. "LEO will become a commercial domain," said Gold, Bigelow's director of D.C. operations and business growth. "Maybe it's difficult to see at this point, but we go back to telecom — there was a time when every communications satellite was owned by the government," he added, noting that today, private companies are now responsible for this space domain and that it touches every aspect of people's lives, such as cellphones. "This will happen when it comes to crew operations." The BEAM mission will allow Bigelow to collect even more data about how its expandable habitat modules perform on orbit. The company blasted two other modules to orbit as stand-alone missions in 2006 and 2007 and plans to launch a private space station someday. Private work in space, Gold noted, is hampered by International Traffic in Arms Regulations (ITAR), which restrict the sharing of technology with other countries, particularly China. Citing "Star Trek," Gold joked that Scottish engineer Montgomery Scott would have had trouble speaking openly with Hikaru Sulu (from Japan) if ITAR were in force on the Enterprise. After gravity, Gold said, ITAR is the second-greatest barrier to getting something off Earth. China, in particular, is the "third rail" of ITAR, Gold said, urging other companies to help him speak to government officials in an attempt to make changes. "We cannot fight the New Space vs. Old Space battle … with so few companies," he said. "The pie is too small. We need to come together as space enthusiasts." Speaking on the same panel as Gold, Bill Gerstenmaier, NASA's chief of human exploration and operations, said commercial operations are needed on the International Space Station because NASA "owes the taxpayers some return." NASA is already starting to put together voluntary international standards that could be used for future orbiting facilities, such as methods of choosing radio frequencies that do not interfere with one another, he said. But the process still needs some work. For example, Gerstenmaier said, astronauts could not eat any of the lettuce grown onboard the space station during a recent experiment because it had to be sent back to Earth for a health and safety check first. "That kind of upset me a bit. Couldn't they just eat a little bit of the lettuce to see if they would survive?" he joked. NASA will use BEAM to evaluate the radiation levels inside the module compared to those on other parts of the space station, he added. The mission is part of NASA's larger push to make low-Earth orbit a place where commercial entities will operate, whether it's through launching CubeSats or ferrying cargo to and from the space station.